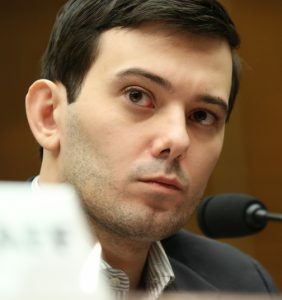 Martin Shkreli is, quite arguably, one of the most hated men in the United States of America. After drawing the ire of the nation a few years back with his choice to increase the price of a critical AIDS drug by around 5770%, followed by a completely remorseless defense of his actions, he has continued to diminish himself in the eyes of the public with a series of–presumably affluenza influenced–publicity stunts flaunting his wealth and lack of sympathy or interest in others. However, it is not his well publicized price jacking that landed him in the courts, it was criminal securities fraud. The Federal Government had accused Mr. Shkreli of eight different counts of fraud and conspiracy to commit fraud. One charge each of fraud for his handling of two of his hedge funds-MSMB Capital and MSMB Healthcare. These charges essentially charged Mr. Shkreli with running a Ponzi scheme-cheating investors by paying older investors with money from newer ones. There were also charges of conspiracy to commit wire fraud and charges of conspiracy to commit securities. Finally, Mr. Shkreli faced charges for conspiracy to commit wire fraud by using funds from the MSMB hedge funds to defraud a pharma company called Retrophin of which he was CEO–using money from Retrophin to pay back MSMB investors as well as to cover his personal debts. Most of the charges can be boiled down to either Ponzi scheme style investment practices or lying to people to get them to invest in his funds-often in the form of formulating false back stories for himself to match the lives of would-be investors and substantially exaggerating his financial experience and education. He also made a practice of substantially overpromising returns, downplaying risks, and fabricating the financial state of his businesses. For example, prosecutors showed evidence that Shkreli told investors his companies had $80M in the bank when he only had around $11,000. What’s more, when investors asked for their money back, Shkreli would put them off for months while acquire the money to return for them. Of the charge facing him, Mr. Shkreli was convicted of conspiracy to commit fraud on Retrophin and a count of securities fraud each for both MSMB hedge funds. Securities fraud is an incredibly broad charge, it can cover innumerable evils. To try to fully explain securities fraud would be to attempt to fit books worth of information into a short article. However, what we can do is look at exactly how fraud is established at a federal level and the additional elements inherent to securities and wire fraud–the charges leveled against Shkreli. Depending on the false statement damaged the victim. A material statement is one that actual impacts the victims decision in taking the action that damages them. So basically, if somebody lies about what car they drive it’s unlikely to change your mind on receiving heart surgery so they wouldn’t be guilty of fraud. Also, if somebody lies and the victim doesn’t believe them, there would be no fraud charges. Reliance on a fraudulent statement needs to be justified, which means that if a reasonable person would never believe or rely on a statement there is no case for fraud. Fraud also does not require an outright lie, there are circumstances where somebody can commit fraud through an intentional complete omission or concealment of a fact or by providing an incomplete truth. Wire fraud and securities fraud are characterized under the law with the basic fraud elements but with one additional element each. For wire fraud, the fraud must be committed by a mail or wire communication. For securities fraud, the fraud must be in connection with the purchase or sale of securities. This includes Ponzi schemes, lying to investors, insider trading, front running, cooking the books and many more types of fraud–basically anything that seeks to deceive investors in violation of securities law and SEC guidelines or in relation to the sale of stocks and commodities. You’ve also no doubt noticed that Shkreli is, in addition to his charges, also charged with conspiracy to commit basically all those charges. Conspiracy is another incredibly complicated area of criminal law. However, it can provide an additional charge beyond just the charge for the crime itself. To avoid getting to deep into another topic that could be a series of articles unto itself, conspiracy can be simplified as a situation where two or more people were in agreement to commit a crime. This isn’t enough on its own in most cases. There needs to be at least some action taken towards accomplishing the planned crime. In Shkreli’s case, this relied on collaboration between him and one of his former attorneys in committing his acts of fraud. However, as the verdict against him was read reports describe him as initially visibly shaken. The effects were not long lasting however, he and his lawyer have since described the ruling-dodging five counts-as a victory. Shkreli continued to call the case a witch hunt even after the ruling. Even with just three of eight counts against him coming back guilty, Shkreli faces as much as 20 years in prison. However, the truth is that it’s very unlikely that he will face the full amount–especially considering his lack of previous criminal history. As of now, Shkreli is out on $5M bail. The three guilty counts also can, and almost certainly will, be appealed. For now, Shkreli is predictably treating the whole situation as a joke. During the trial, prosecutors characterized Mr. Shkreli as a man who believed himself above the law, his behavior after the ruling tracks with this. Only around an hour after the guilty ruling, he was streaming online telling his followers that any sentence against him would be “close to nil” and predicting a Club Fed situation where he’d play video games and basketball all day for a few months. There is a fair bit of judicial discretion as to exactly how much time Mr. Shkreli will face and a long way to go before an ultimate end to this case will be reached. However, the weight of being found guilty of fraud-and the repercussions of that decision-seem to have reached Mr. Shkreli not at all. We’ll simply have to wait and see where this case leads and just how hefty the ramifications of Mr. Shkreli’s fraud end up being.